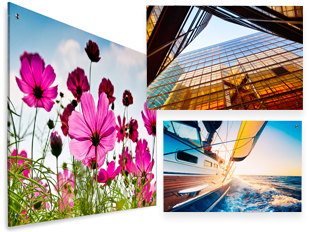 Adding office wall art is an affordable and attractive way to spruce up any office waiting room. By putting up generic canvas and acrylic paintings your office or lobby will look nicer while remaining neutral of everyone's tastes and opinions. Many professionals prefer generic nature artwork as it doesn't displease anyone, send the wrong message, or clash with other items and decor. Utilizing office artwork makes decorating a cinch. While we do offer classic framed canvas prints, we also carry modern second-surface acrylic prints! These products feature high resolution UV printing on the back of acrylic sheets, giving the images a glossy, contemporary appearance. The acrylic panels are then mounted to walls using standoffs. 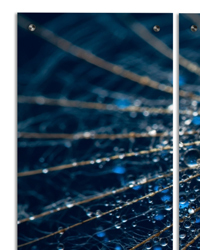 Triptychs are also available in this style! Choose between acrylic prints of nature scenes, or geometric cityscapes. 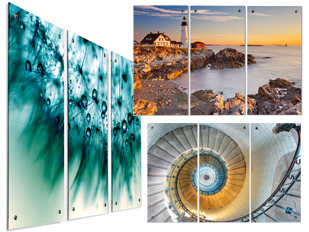 More About UV Printed Office Wall Art: Images printed with UV printers are in a class all of their own. What sets UV printers apart from others is the way they dry or cure the ink they print. Our UV printer contains powerful LED lights that dry the ink immediately after it is printed, keeping it the designs sharp and ensuring the highest resolution and detail available. To learn more about how UV printing works, check out our article! What Types of Art Prints are Available? One office print features a scene of a seemingly never-ending forest path. The trees strike a fine balance between intimidating and welcoming to get observers to ponder their purpose. The path can be seen as a metaphor for one's life journey - crystal clear, yet shrouded in mystery. This art features warm color tones to nicely balance out blues and grays. Take a mysterious approach with a masterpiece of acrylic wall art that combines both the structure and effortless beauty that embodies a descending stone staircase. The seemingly endless stairwell begs one to wonder "Where do the steps lead? ", and inspires creativity in this way. 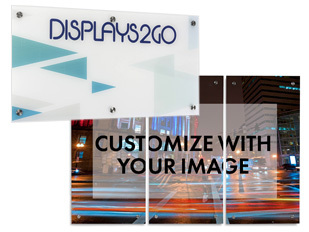 A UV printed 24" x 36" panel is the perfect solution for corporate office and lobby locations. Feeling a nautical theme? Imagine the liberating feeling of sailing across an endless sea. That's exactly where a sailboat print takes you. The tranquility of such a canvas relaxes and calms observers, which can be especially valuable for doctor's offices and DMVs - areas known to induce high amounts of stress. Allow your clients to breath in the ocean air and let their mind float away with a sailboat print. For the office downtown, allow your eyes to sweep up the shining glass fronts of urban giant skyscrapers, feeling at once energized by the modern form and put at peace by the natural elements it reflects. Hang this acrylic office art in any modern business location. Lighthouses represent omniscience and safety. Just as lighthouses are a source of safety for passing ships, the quiet serenity of this office wall art evokes a sense of security, comfort and well-being in observers. Lighthouse prints are commonly used in coastal cities and towns. Slowly awaken your senses and emotions as you observe the sun forever trying to peak its way over the mountain top with a sunrise print. The fog hanging over the landscape helps one feel grounded in nature and the rising sun is a reminder of new beginnings. A mountain print, like the ones offered here, display a seemingly endless string of ridges and valleys. Adding nature scenes to an office can also improve the mood of patients, clients and customers. Blank walls can create a melancholy environment, simply filling them up with generic prints can make a visually impactful difference. These are just some of the available prints are described here, for the full selection please visit the categories!